csv and xml files into a Summary Workbook. 1) Download the correct version and extract it to a local directory. 2) Copy RDBMerge.xla(m) to a unprotected directory on your system. 3) Start Excel and open a workbook. click OK. Verify RDBMerge is checked in the add-in list and then click OK.
2007: Click the Microsoft Office Button, click Excel Options, click the Add-Ins tab. 2010-2013: Click on File, click on Options, click the Add-ins tab. In the Manage drop-down, choose Excel Add-ins, and click Go. Use “Browse” to go to the add-in and then click on OK. Verify RDBMerge is checked in the add-in list and then click OK. In Excel 2007-2013 you find a button named RDBMerge on the Ribbon on the Data tab to open the UserForm. In Excel 97-2003 you find the menu option RDBMerge in the Data menu to open the UserForm. In the folder location section click on the Browse button and select the folder with the files you want to merge. After you do that you see the path returned in the UserForm. In the section "Which Files" select the type of files in the dropdown that you want to merge. If you use the first option "XL?" it will merge all type of Excel files with an extension that start with XL (xls, xlsx, xlsm, xlsb). But you can also only merge files with a specific extension in the folder.By default the option to merge all files in the folder is selected but you can also use the option to filter on the file names, click on the Tips button for more information. 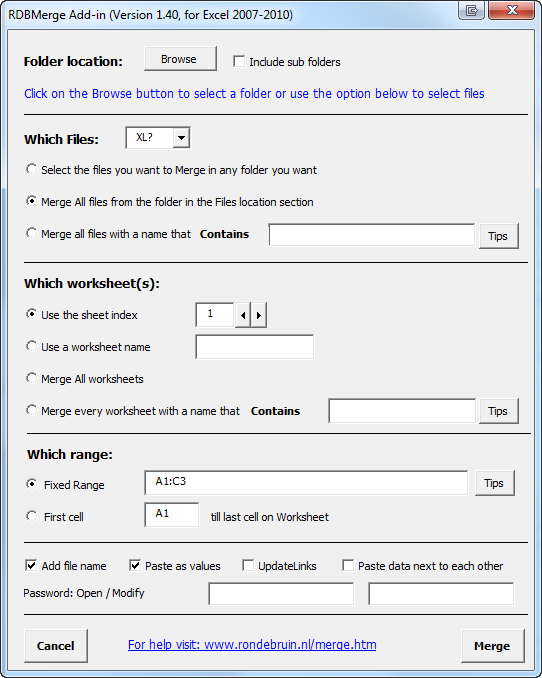 In the Add-in for Excel 2007-2013 there is also an option to select the files you want, easy if you do not want to merge all the files in the folder. In this section you have the option to choose the worksheet by index or name. If you use the index 1 it will use the first worksheet in each file, you not have to know the worksheet name this way. You can also merge data from all worksheets or use the filter option to filter on the worksheet names, click on the Tips button for more information. You have the option to merge a fixed range (can be more than one area). Click on the Tips button for more information. Or use the First cell ? till last cell on worksheet option, you can change the start cell (default = A1). Use A2 for example if you not want to copy your header each time. Before we press on the Merge button we have a few options here that you can change. 1: The Add file name checkbox will add the file name or file and sheet name before or above your data. You can use it for example to filter the Combine sheet for the data from a certain file. 2: To avoid problems with formulas I suggest you check Paste as values. 3: If your workbooks have links to other workbooks use the UpdateLinks option to update the values. 4: Use the Paste data next to each other option if you want paste the data from each file next to each other instead of below each other. If you set your fixed range for example to A1:A100 and check this check box it will use one column for each file in the combine sheet. If you range have two columns it will use two columns for each file in the combine sheet. 5: If your workbooks have an Open password you can fill in the open/modify password in the two text boxes, it is no problem if there are also workbooks with no password in the folder. Then it is up to you if you want to save this workbook. You see it is very easy to work with this add-in, testing all options with a few files in a test folder is the best way to get familiar with this add-in. If you have problem or suggestions let me know and I try to help you. Note: If you merge XML files it is possible that you get a warning that Excel will be creating its own schema for this schema-free document, check the checkbox "In the futere, do not show this message" to stop this. Note: Download the add-in that is correct for your Excel version, If you want a Mac version of the add-in check out the Mac section on my website.